Bansko hotel in Bansko ski resort in Bulgaria. - 10 % discount until 30 Nov 2017! 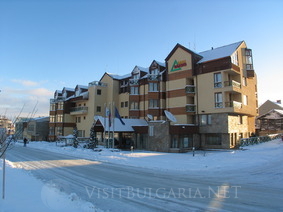 Location: Bansko hotel is located 1500 m from the ski lift in Bansko mountain resort. The hotel offers a shuttle-bus to the lift. Accommodation: The hotel offers 28 double rooms, 12 double rooms deluxe, 9 one-bedroom apartments and 4 two-bedroom apartments. Double rooms (18 sq.m.) feature Two single beds, Heating, TV SAT, Phone, Internet access, Mini bar, Bath-tub or shower, Hair-drier. One-bedroom apartments (42 sq.m.) offers Double bed, Air-conditioner, Heating, TV SAT, Internet access, Mini bar, Bath-tub, Hair-drier. Room amenities: Daily maid service, Linen is changed 1 times a week, Towels are changed 1 times a week, Cosmetic set in the bathroom, Dressing gowns/ Slippers, Laundry, Iron rent. Bars and restaurants: The hotel offers a restaurant with Bulgarian cuisine and vegetarian menu and a bar. The hotel offers room service, as well. Spa and wellness: At guests' disposal are indoor swimming pool 30 °C, fitness, sauna, massages. Entertainment: At guests' disposal are Billiards, Game machines, Ski and Snowboard Depot, Table tennis (Ђ). Facilities: Elevator - 2, Safe at the reception (Ђ), Indoor swimming pool 30 °C, Internet cafe (Ђ), Wi-Fi (around reception area), Сredit cards, Currency exchange, Disabled friendly, Parking, Baby-sitter (on request, Ђ), Baby cot (free of charge). Business facilities: For business meeting and conferences the hotel offers a conference hall and a business сеnter.